If you’re hunting for a cost effective and efficient solution to process mineral or sand from wet feed to dry graded product, your search is over. iBulk Solutions, one of Australia’s leading innovators in the Fine Particle Separation and Processing Equipment industry, has invested heavily in the design and development of a new system that speeds up through-put times, thereby reducing the cost per tonne. 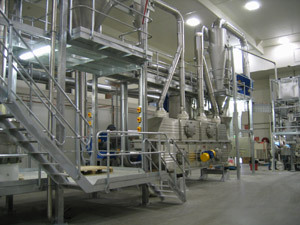 “Our team of talented engineer’s have combined our proprietary technology with vibrating process equipment, conveyors, iBulk /Carrier Dryers and Rotex Gyratory Screeners to develop a turnkey plant that can be installed for 10-15 tph of sand that can be dried from 10-12% down to whatever you require,” explained Tony Webber, managing director, iBulk Solutions. Not only is iBulk’s solution extremely compact, they have actually gone so far as to make these plants transportable, as they only require the electrical and gas services to be connected on site. The results showed that plants using vibrating fluid bed drying technology could expect operational savings on fuel alone to be as high as 30% per annum when compared with rotary drum dryers. Tony then went on to explain that additional savings are available as annual maintenance costs for vibrating fluid bed drying are minimal. “In addition to these advantages, utilising vibrating fluid bed drying technology can also assist companies’ to combat future Carbon Taxation requirements,” said Tony. “In conjunction with Carrier, we have developed dryers for coal drying and processing that removes excess moisture from bituminous coal before it is used in boilers and similar applications. “Additional saving on emissions can be achieved by the ability of our drying systems to recycle hot air therefore reducing the amount of combustion required to achieve the drying requirement,” he added.